First, she mentions the freedom that comes with turning 40. Basically, she said you really just stop caring what people think about you and do your own thing. I loved that. I’m 30 years old now and I’m almost there. I feel myself getting closer everyday. I’m certain I’ll totally be there before I”m 40. Second, she talks about how she battled with weight for years and it wasn’t until she dated Jermaine Dupri that she realized that she’s beautiful and that’s okay to have some booty. 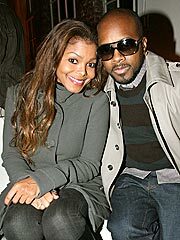 Jermaine Dupri is alright with me. One thing I love about black men, they like women with curves, some meat on their bones, some booty, some hips, and some thighs. Research has found that black women have some of the best body image and I think a lot of it has to do with black men. I am a plus sized woman and I’ve never really had a problem dating men. When you look at the women in black culture that men go crazy over, they’re curvaceous women. Janet Jackson is a gorgeous woman, but even she had issues with her body. It wasn’t years in the spotlight or getting on a most beautiful women’s list to make her feel better about herself. It was the love and support of a good man. A good black man. …is loving the heck out of this song. I really wish love was easy. I wish that we could just choose who we love and totally fall for the sweet guy who worships us and treats us like a queen. Instead we, and by we I mean me, like the guy who never calls and is always too busy for us. I have a guy friend who, no lie, faithfully calls me everyday. We hung out like two or three times when I lived in Washington D.C. and I saw early on that nothing was gonna happen. He was just a bit too immature for me. I’ve been back in Atlanta for over a year and he still calls me constantly. Its annoying. Meanwhile I hung out with Mr. Wonderful a few times and he is always too busy to take my calls. I can’t go to his house. And I can’t stop thinking about him. It’s pretty obvious that he’s hiding something. A girlfriend? A boyfriend? Bodies in the basement? I don’t know. I kind of think his keeping me at a distance makes me want him more. Its like that joke “I wouldn’t want to be in a club that would have me as a member.” I think a part of me thinks that if D.C. dude is so into me then he must not have much going on. I never think that I’m a charming, attractive person that he just fell for. I’m to him what Mr. Wonderful is to me. Help me out. Why is love so hard? Why can’t we choose who we love? What’s the best way to forget about someone?